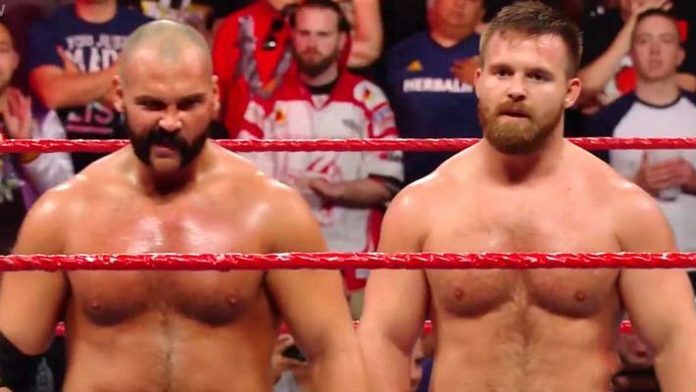 WWE RAW Tag Team Champions The Revival (Scott Dawson and Dash Wilder) were back at it again by teasing to bring back the old design of the WWE Tag Team Titles, which has fans talking. They did so back in February with a series of posts on social media and Wilder brought up the idea of bringing back the classic design yet again. He shared this photo of the throwback WWE Tag Team Titles on his official Twitter account. This is just one of the many examples of how these two WWE stars want to bring back tag team wrestling to its glory days on the red brand. This photo was taken and shared before they successfully retained the gold over Bobby Roode and Chad Gable at a live event on Sunday night in Amherst, MA at the Mullins Center. Drew McIntyre defeated Dean Ambrose with the Claymore Kick. No Way Jose defeated EC3. Apollo Crews defeated Luke Harper. WWE Women’s Tag Team Champion Sasha Banks & Bayley defeated The Riott Squad’s Sarah Logan & Ruby Riott. Mojo Rawley & The Ascension defeated Titus O’Neil & Curt Hawkins & Zack Ryder. Braun Strowman defeated Baron Corbin with a powerslam – No DQ match.